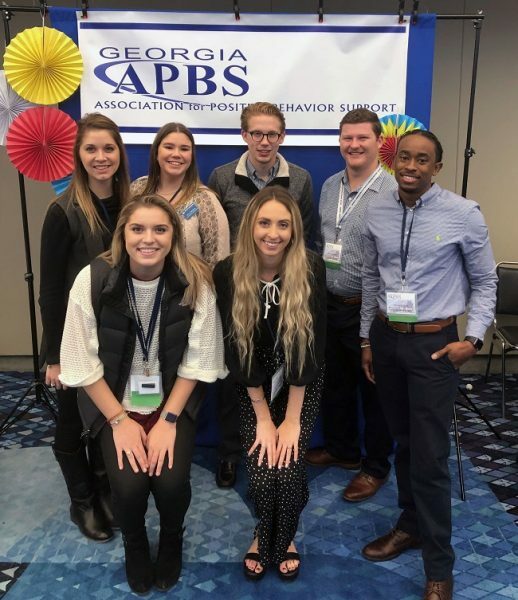 Undergraduate special education students attended Georgia Association for Positive Behavior Support Conference in 2018. In December, College of Education faculty member Kymberly Harris, Ph.D., took seven special education undergraduate students to the 2018 Georgia Association for Positive Behavior Support (GAPBS) Conference in Atlanta. The students, including Amanda Floyd, Amber Leggett, Zach Ledbetter, Casey Carroll, Kenneth Cole and Gabby Brueck, served as volunteers for the conference, completing registration for the over 1,700 registrants. Carroll and Leggett also participated in poster presentations. Leggett presented “Critical Review of School Policy,” an analysis of the implementation of positive behavior interventions and supports (PBIS) in a rural southeast Georgia classroom. Leggett observed the student response and results of PBIS to develop a rationale for the use of these methods in the classroom. Carroll presented “Behavioral Responses in the Inclusion Setting,” detailing her experiences observing how general education teachers handle behavioral issues from students with disabilities in the inclusion classroom setting, where both general education and special education students are taught in the same setting. Students also participated in a presentation given by Harris along Georgia Department of Education (GaDOE) colleagues. The presentation centered on the creation of a PBIS graduate endorsement series that recently passed final review with the Professional Standards Committee. The course series of courses will offer students detailed insight into implementing PBIS in the classroom and is the first endorsement of its kind in the United States. The students were able to provide valuable insight into the observations they have completed in comparing PBIS to traditional behavior modifications with teaching students with disabilities.